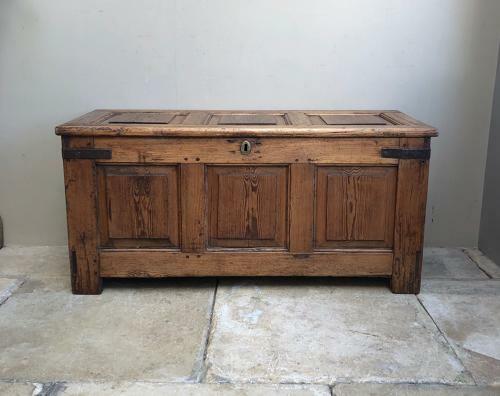 LOVELY condition Mid 18th Century c.1750 Pine Panelled Coffer. Much harder to find in pine - nearly always in oak. Great looking piece panelled all the way round...pegged construction..original iron strapping and hinges. Front escutcheon lock changed only. Inside good and clean. A very useable piece...lots of hidden storage and strong enough to sit on or have as a coffee table (as the back is so good too).